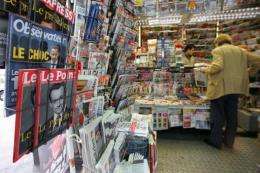 A Parisian newstand. French online classified advertisements exceeded ads in print publications for the first in 2011, the Xerfi-Percepta market research firm said on Tuesday, but warned of a slowdown of spectacular growth. French online classified advertisements exceeded ads in print publications for the first in 2011, the Xerfi-Percepta market research firm said on Tuesday, but warned of a slowdown of spectacular growth. "While online classifieds jumped by 17 percent last year, print classifieds fell by 2.6 percent from 2010," a Xerfi-Percepta study said. "The Internet now accounts for 51 percent of the 1.3-billion-euro classified advertising market, compared to 7 percent in 2003," it added. The emergence of online classifieds has hurt newspapers in many parts of the world, with the small advertisements for employment, romance, housing and cars having been a key source of revenue. Xerfi-Percepta estimated the online classified market last year at 669 million euros against 635 for the print classified market, for a total of 1.304 billion euros ($1.69 billion). Xerfi said the collapse of the free-print classified magazines sector had also helped push online classifieds ahead. It noted however that the online classifieds sector was not immune to the economic crisis, and expected a slowdown in growth through 2015, when it is expected to hit 700 million euros.